Abstract: Supercritical carbon dioxide (SC-CO2) fractionation technology can effectively separate different types of ginsenosides from the roots of Panax ginseng, which have been shown to possess various physiological activities. The objective of this study was to evaluate the antioxidative and anti-inflammatory activities as well as the therapeutic index of SC-CO2 fractions from P. ginseng C.A. Meyer. Of the various extracted fractions and residues, the F3 fraction exhibited the highest antioxidative property. The half maximal effective concentration (EC50) values of the F3 fraction for reducing power, hydrogen peroxide scavenging activity, and thiobarbituric acid assay were 4.51, 2.60, and 0.22 mg/mL, respectively. The F3 fraction also possessed the strongest anti-inflammatory effect in lipopolysaccharide-stimulated human THP-1 monocytic-like cell line, by decreasing tumor necrosis factor alpha (TNF-α) and interleukin 6 (IL-6) production. In addition, the F3 fraction exhibited a high therapeutic index, which is the ratio of 50% cytotoxic concentration (CC50) and EC50. In conclusion, high antioxidative and anti-inflammatory activities and therapeutic index value were observed in the F3 fraction of the roots of P. ginseng C.A. Meyer. SC-CO2 technology is a feasible method to improve the antioxidative and anti-inflammatory activities of P. ginseng. Supercritical carbon dioxide (SC-CO2) extractive fractionation is a separation technology based on the solubility of active compounds, which in turn depends on vapor pressure and polarity. In our previous study, the ethanolic extract (E) of P. ginseng was SC-CO2 fractionated in series separators under varying pressures to yield a residue (R) (material insoluble in SC-CO2) and three extracted fractions (fractions F1, F2, and F3). Among those fractions, E possessed the highest content of total ginsenosides and F3 had the highest content of deglycosylated ginsenosides.17 The aim of this study was to further clarify the antioxidative and anti-inflammatory activities of SC-CO2-fractionated P. ginseng. P. ginseng C.A. Meyer root powder was purchased from Wah Hong Ginseng Company, Kaohsiung, Taiwan. 1,1-Diphenyl-2-picrylhydrazyl (DPPH), trichloroacetic acid (TCA), ferrocyanate, phenol, hydrogen peroxide (H2O2), 4-aminoantipyrine, lipopolysaccharides (LPS), phorbol 12-myristate 13-acetate (PMA), and horseradish peroxidase (HRP) were purchased from Sigma Chemical Co. (St Louis, MO, USA). Sulfuric acid and sodium chloride were purchased from J. T. Baker (Phillipsburg, NJ, USA). THP-1 human monocytic cells were obtained from the American Type Culture Collection TIB-202. Roswell Park Memorial Institute (RPMI) 1640 medium, fetal bovine serum (FBS), L-glutamine, phosphate buffer saline (PBS), penicillin, and streptomycin were purchased from Gibco BRL (Grand Island, NY, USA). Thiobarbituric acid-reactive substance (TBARS) Assay Kit 10009055 was obtained from Cayman Chemical (Ann Arbor, MI, USA). OptEIA ELISA kits specific against human cytokines, tumor necrosis factor alpha (TNF-α), and interleukin 6 (IL-6) were obtained from BD Bioscience (San Diego, CA, USA). The fractionation of P. ginseng was prepared according to methods described in our previous work.17 Ethanolic extracts of P. ginseng C.A. Meyer root powder were fractionated using SC-CO2 at a temperature of 45°C, pressure of 30 MPa, flow rate of CO2 at 4 mL/min, and an inflow rate of sample at 1 mL/min. Four separators connected in series at pressures of 30, 25, 20, and 15 MPa were used to yield F1, F2, F3, and R, respectively. The collected samples were then freeze-dried and stored at −20°C until use. The antioxidant properties investigated were expressed as half maximal effective concentration (EC50) values for comparison. EC50 values were calculated by interpolation from linear regression analysis, which denoted the concentration of the sample required to decrease the absorbance by 50%. Higher EC50 values indicate lower effectiveness in antioxidative properties. The scavenging ability of DPPH radicals was assayed according to the method by Shimada et al18 with modifications. Each extract or fraction (1–20 mg/mL) in deionized water (4 mL) was mixed with 1 mL ethanolic solution of DPPH, resulting in a final concentration of 0.5 mM DPPH. The mixture was vigorously shaken and left to stand for 30 min in the dark. DPPH radical reduction was determined by measuring the absorbance (A) at 517 nm. The DPPH scavenging activity (%) was calculated as follows: scavenging ability (%) = [1 − (Asample/Acontrol)] ×100. The reducing power of the extract or fractions was determined using the method described previously.19 A series of the samples (0.1–20 mg/mL) were diluted in 0.2 M phosphate buffer (pH 6.6) containing 1% ferrocyanate. After the mixture was incubated at 50°C for 20 min, 10% TCA (2.5 mL) was added to a portion of this mixture (5 mL) and centrifuged at 3,000× g for 10 min. The supernatant was mixed with distilled water (2.5 mL) containing 1% ferric chloride (0.5 mL), after which the absorbance was measured at 700 nm. The H2O2 scavenging activity of each fraction was assayed according to the method described by Yen and Chung20 with slight modification. Different concentrations of sample (1 mL) were mixed with 400 μL of H2O2 solution (4 mM) and then incubated at room temperature for 20 min. The mixture was supplemented with 600 μL of HRPase-phenol red solution. After 10 min, the absorbance (A) was measured at 610 nm with a spectrophotometer. Distilled water was used as a control, and ascorbic acid was used for comparison. The H2O2 scavenging activity (%) was calculated as follows: scavenging activity (%) = [1 − (Asample)/(Acontrol)] ×100. The analysis of malondialdehyde (MDA) by thiobarbituric acid (TBA) assay was based on the reaction of MDA with TBA, forming a MDA–TBA2 adduct that absorbs strongly at 532 nm. The assay was conducted according to the manufacturer’s instructions (TBARS Assay Kit Item No 10009055). Briefly, serial dilutions of MDA standard (0, 0.0625, 0.125, 0.25, 0.5, 1, 2.5, and 5 μM) or test samples were added to 100 μL of sodium dodecyl sulfate solution and mixed well, followed by adding another 4 mL of color reagent. The reactions were preceded at boiling temperature at 90°C for 1 h to form the MDA–TBA adduct. The reactions were stopped by placing the reaction mixture into an ice bath for 10 min, followed by centrifugation at 1,600× g at 4°C for 10 min. The reactions were then warmed and stabilized at room temperature for 30 min followed by measuring colorimetrically at 530–540 nm. The equation of the average absorbance used for each standard and sample was as follows: MDA (μM) = [(corrected absorbance) − (y-intercept)/slope]. Human THP-1 cells were treated with different concentrations of E, R, F1, F2, or F3 (100–800 μg/mL) for 24 h, and cytotoxicity against the THP-1 cells was assessed via trypan blue exclusion counting assay. CC50 was defined as the concentration of compound (μg/mL) required for a 50% reduction in cell viability. THP-1 human monocytic cells were maintained in suspension in high-glucose RPMI 1640 medium containing 10% FBS, L-glutamine (2 mM), penicillin (100 U/mL), and streptomycin (100 μg/mL). To induce differentiation, the cells in 12-well culture dishes at a density of 2×105 cells/mL were cultured with RPMI medium containing 10 μM PMA for 48 h. After induction, differentiated cells adhered to the flask, whereas undifferentiated monocytic cells remained in suspension and were removed by washing with PBS. To examine anti-inflammatory capacities of the ginseng E, R, F1, F2, or F3, differentiated THP-1 cells cultured in serum-free RPMI were pretreated with ginseng samples (13–400 μg/mL) for 1 h, and then stimulated with LPS (0.1 ng/mL) for 24 h.
After stimulation with LPS, the cytokine concentrations of cell supernatants were determined using OptEIA ELISA kits specific against human cytokines, TNF-α, and IL-6, according to the manufacturer’s instructions. Data were expressed as mean ± standard deviation (SD) of three replicates. Statistical evaluation of data was performed by Pearson’s product-moment correlation analysis and one-way analysis of variance, followed by Duncan post hoc tests. A P-value of <0.05 was considered statistically significant. Ginsenosides are one of the main active ingredients of P. ginseng and are thought to be responsible for the various therapeutic effects of ginseng.12 Our previous study demonstrated that SC-CO2 fractionation technology could successfully fractionate ginseng extracts into R, F1, F2, and F3 fractions, which were found to be associated with different levels of biological activities due to varying contents of ginsenoside types.17 The content of total ginsenosides was highest in E, while the content of deglycosylated ginsenosides was highest in F3. Findings from this study demonstrated that SC-CO2 fractionation technology could significantly increase the antioxidative activities, including H2O2 scavenging, reducing power, and antilipid oxidation of the fractions compared to the original P. ginseng extract (Table 1). A dose-dependent relationship was observed between the antioxidative activities tested and the concentrations of the extract and fractions. Similar to the observation made by Chien et al,17 our study showed that the DPPH scavenging ability, in a decreasing order, was R > F1 > E > F2 > F3. On the other hand, F3 exerted the strongest activities in the other three antioxidative assays (H2O2 scavenging, reducing power, and antilipid oxidation). The inconsistencies regarding the outcomes among various antioxidative assays might be attributed to different reaction mechanisms of the assays and the structural features of the antioxidant.21 Active constituents of various P. ginseng fractions appeared to exert different aspects of protective effects against harmful reactive oxygen species and will require further investigation to fully elucidate. Notes: EC50 value was obtained by interpolation from linear regression analysis. Data within the same row with different superscripts are significantly different at P<0.05. Abbreviations: DPPH, 1,1-diphenyl-2-picrylhydrazyl; E, ethanolic extract; F, fraction; H2O2, hydrogen peroxide; R, residue; SD, standard deviation. 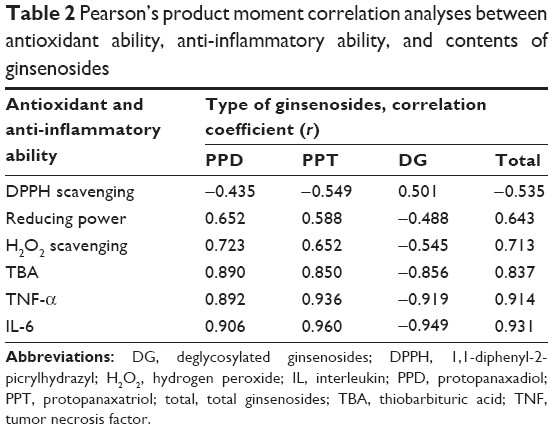 Previous research reported that ginsenosides exhibited a strong antioxidant capacity.22 In particular, studies found that deglycosylated ginsenosides Rg3, Rk1, and Rg5 possessed a stronger antioxidative capacity than PPD or PPT.23 Table 2 lists the correlation coefficients between ginsenoside types and their antioxidative activities. F3, the fraction that deglycosylated ginsenosides are primarily present, was the fraction with the strongest capacity for protecting oxidative damage. Deglycosylated ginsenosides (including Rh1, Rh2, and Rg3) might be the main ingredient responsible for the high antioxidative capacity in P. ginseng C.A. Meyer. Abbreviations: DG, deglycosylated ginsenosides; DPPH, 1,1-diphenyl-2-picrylhydrazyl; H2O2, hydrogen peroxide; IL, interleukin; PPD, protopanaxadiol; PPT, protopanaxatriol; total, total ginsenosides; TBA, thiobarbituric acid; TNF, tumor necrosis factor. Ginseng has also been recognized as an immune modulator to regulate the generation of proinflammatory cytokines. Ginsenosides, especially deglycosylated ginsenosides, are considered to be the key immune adjuvanticity molecules among the whole ginseng extract.6,14,24 Since SC-CO2 fractionation altered the distribution of ginsenoside types in fractions, the cytotoxic and anti-inflammatory effects of ginseng SC-CO2 fractions in human THP-1 monocytes were further examined. As depicted in Figure 1, the concentration of a 50% reduction in cell viability of the SC-CO2-fractionated samples, in a decreasing order, was R (796 μg/mL), E (326.8 μg/mL), F2 (743 μg/mL), F1 (704 μg/mL), and F3 (292 μg/mL). F3 exhibited the highest cytotoxicity to THP-1 cells compared to other fractions. 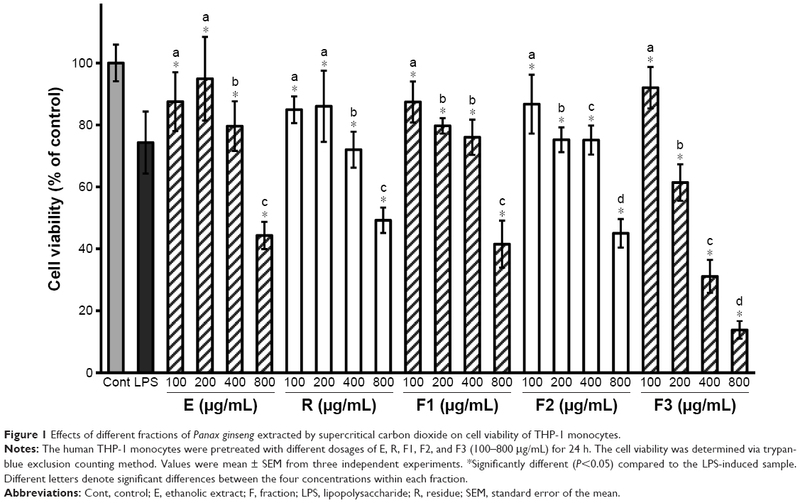 Figure 1 Effects of different fractions of Panax ginseng extracted by supercritical carbon dioxide on cell viability of THP-1 monocytes. Notes: The human THP-1 monocytes were pretreated with different dosages of E, R, F1, F2, and F3 (100–800 μg/mL) for 24 h. The cell viability was determined via trypan-blue exclusion counting method. Values were mean ± SEM from three independent experiments. *Significantly different (P<0.05) compared to the LPS-induced sample. Different letters denote significant differences between the four concentrations within each fraction. Abbreviations: Cont, control; E, ethanolic extract; F, fraction; LPS, lipopolysaccharide; R, residue; SEM, standard error of the mean. Next, the anti-inflammatory ability of the SC-CO2-fractionated samples was evaluated in LPS-stimulated THP-1 cells. The dose-dependent inhibitions against LPS on the production of proinflammatory cytokines, TNF-α, and IL-6 in THP-1 cells are shown in Figures 2 and 3, respectively. F3 was the fraction with the highest capacity to protect THP-1 cells against both the increasing TNF-α and IL-6 induced by LPS. Table 3 shows that the concentration of SC-CO2-fractionated samples of P. ginseng C.A. Meyer to achieve a half reduction of TNF-α (EC50) by LPS in THP-1 cells, in a decreasing order, was F2 (364 μg/mL), R (327 μg/mL), F1 (304 μg/mL), E (281 μg/mL), and F3 (22 μg/mL). It should be noted that F3 showed not only the lowest EC50 value, but the magnitude was also less than one-tenth of the other fractions. In addition, F3 also showed the lowest EC50 value for reducing IL-6 production. The EC50 of the different SC-CO2-fractionated samples for IL-6 was determined as, in a decreasing order, R (220 μg/mL), F2 (212 μg/mL), E (190 μg/mL), F1 (188 μg/mL), and F3 (47 μg/mL). Again, it should be noted that F3 showed not only the lowest EC50 value, but the magnitude was also at least 75% less than the other fractions. It has been reported that some ginsenosides, such as Rb1 and Rg1, could significantly inhibit TNF-α production.25 Rb1, Rh2, Rd, and the metabolite compound K (CK) have been shown to potentiate the responses of P2X7, a molecule that has achieved the status of an essential immunomodulatory receptor.26 Furthermore, Rg3 has been shown to be a potential adjuvant in OVA-immunized BALB/c mice.27 In this study, we showed that F3, the deglycosylated ginsenoside-enriched fraction fractionated by SC-CO2, composed of Rh1, Rh2, and Rg3, exhibited the highest anti-inflammatory ability in THP-1 cells compared to the other tested fractions. 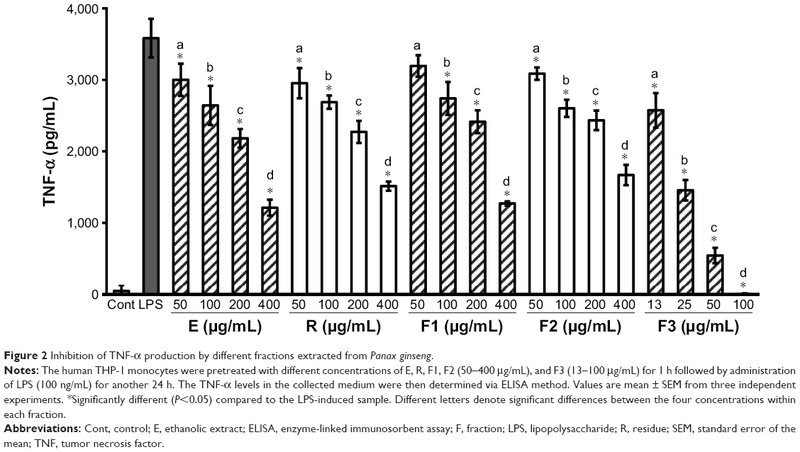 Figure 2 Inhibition of TNF-α production by different fractions extracted from Panax ginseng. Notes: The human THP-1 monocytes were pretreated with different concentrations of E, R, F1, F2 (50–400 μg/mL), and F3 (13–100 μg/mL) for 1 h followed by administration of LPS (100 ng/mL) for another 24 h. The TNF-α levels in the collected medium were then determined via ELISA method. Values are mean ± SEM from three independent experiments. *Significantly different (P<0.05) compared to the LPS-induced sample. Different letters denote significant differences between the four concentrations within each fraction. Abbreviations: Cont, control; E, ethanolic extract; ELISA, enzyme-linked immunosorbent assay; F, fraction; LPS, lipopolysaccharide; R, residue; SEM, standard error of the mean; TNF, tumor necrosis factor. 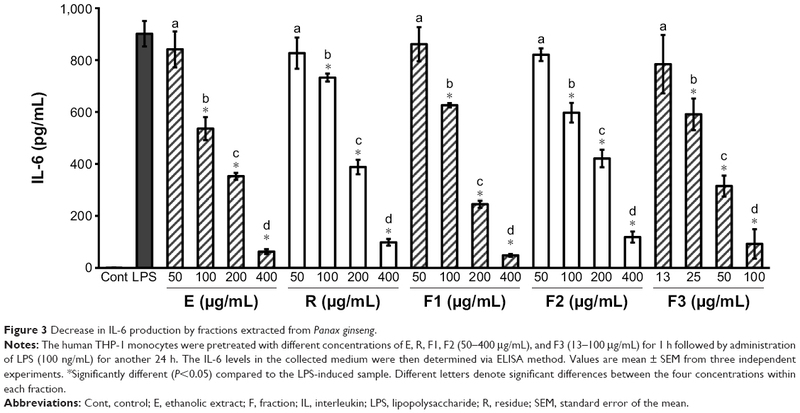 Figure 3 Decrease in IL-6 production by fractions extracted from Panax ginseng. Notes: The human THP-1 monocytes were pretreated with different concentrations of E, R, F1, F2 (50–400 μg/mL), and F3 (13–100 μg/mL) for 1 h followed by administration of LPS (100 ng/mL) for another 24 h. The IL-6 levels in the collected medium were then determined via ELISA method. Values are mean ± SEM from three independent experiments. *Significantly different (P<0.05) compared to the LPS-induced sample. Different letters denote significant differences between the four concentrations within each fraction. Abbreviations: Cont, control; E, ethanolic extract; F, fraction; IL, interleukin; LPS, lipopolysaccharide; R, residue; SEM, standard error of the mean. Notes: CC50 was defined as the concentration of compound (μg/mL) required for the 50% reduction of cell viability. EC50: values calculated by interpolation from linear regression analysis, which denoted the concentration of the sample required to decrease the cytokines by 50%. Abbreviations: E, ethanolic extract; F, fraction; IL, interleukin; R, residue; TNF, tumor necrosis factor. 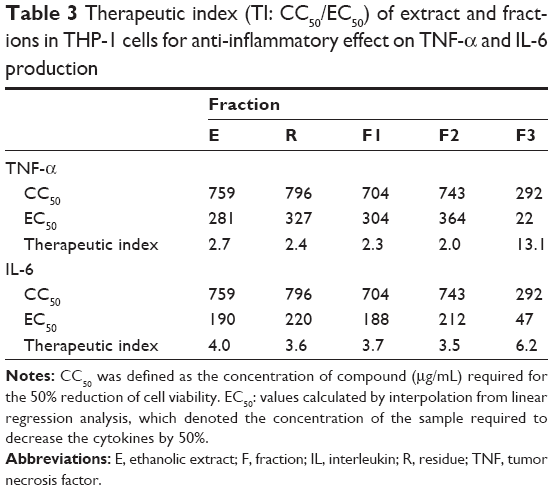 Furthermore, a therapeutic index (CC50/EC50) was calculated to evaluate the safety window of each extract in THP-1 cells for anti-inflammatory effect on TNF-α and IL-6 production. As indicated in Table 3, F3 exhibited the highest therapeutic index value for both TNF-α (13.1) and IL-6 (6.2) among the tested extracts of P. ginseng, suggesting a potential for further evaluation of its pharmacological applications. Fractionation using SC-CO2 could significantly increase the deglycosylated ginsenoside content and antioxidative activities in vitro. This study was also the first to demonstrate that SC-CO2-fractionated F3 exhibited a high therapeutic index in regulating the functionality of immune cells. Therefore, findings from this study suggested a novel application of SC-CO2 to obtain a deglycosylated ginsenoside-enriched fraction from the roots of P. ginseng C.A. Meyer with strong antioxidative and anti-inflammatory activities. Kim HG, Yoo SR, Park HJ, et al. Antioxidant effects of Panax ginseng C.A. Meyer in healthy subjects: a randomized, placebo-controlled clinical trial. Food Chem Toxicol. 2011;49(9):2229–2235. Yang X, Wang R, Zhang S, et al. Polysaccharides from Panax japonicus C.A. Meyer and their antioxidant activities. Carbohydr Polym. 2014;101:386–391. Li J, Ichikawa T, Jin Y, et al. An essential role of Nrf2 in American ginseng-mediated anti-oxidative actions in cardiomyocytes. J Ethnopharmacol. 2010;130(2):222–230. Wu Y, Xia ZY, Dou J, et al. Protective effect of ginsenoside Rb1 against myocardial ischemia/reperfusion injury in streptozotocin-induced diabetic rats. Mol Biol Rep. 2011;38(7):4327–4335. Yuan SM. Potential cardioprotective effects of Ginseng preparations. Pak J Pharm Sci. 2015;28(3):963–968. Park D, Bae DK, Jeon JH, et al. Immunopotentiation and antitumor effects of a ginsenoside Rg(3)-fortified red ginseng preparation in mice bearing H460 lung cancer cells. Environ Toxicol Pharmacol. 2011;31(3):397–405. Jeon WJ, Oh JS, Park MS, Ji GE. Anti-hyperglycemic effect of fermented ginseng in type 2 diabetes mellitus mouse model. Phytother Res. 2013;27(2):166–172. Liu Z, Li W, Li X, et al. Antidiabetic effects of malonyl ginsenosides from Panax ginseng on type 2 diabetic rats induced by high-fat diet and streptozotocin. J Ethnopharmacol. 2013;145(1):233–240. Oh MR, Park SH, Kim SY, et al. Postprandial glucose-lowering effects of fermented red ginseng in subjects with impaired fasting glucose or type 2 diabetes: a randomized, double-blind, placebo-controlled clinical trial. BMC Complement Altern Med. 2014;14:237. Qi LW, Wang CZ, Yuan CS. American ginseng: potential structure-function relationship in cancer chemoprevention. Biochem Pharmacol. 2010;80(7):947–954. Nag SA, Qin JJ, Wang W, Wang MH, Wang H, Zhang R. Ginsenosides as anticancer agents: in vitro and in vivo activities, structure-activity relationships, and molecular mechanisms of action. Front Pharmacol. 2012;3:25. Leung KW, Wong AS. Pharmacology of ginsenosides: a literature review. Chin Med. 2010;5:20. Park E, Hwang I, Song JY, Jee Y. Acidic polysaccharide of Panax ginseng as a defense against small intestinal damage by whole-body gamma irradiation of mice. Acta Histochem. 2011;113(1):19–23. Niu T, Smith DL, Yang Z, et al. Bioactivity and bioavailability of ginsenosides are dependent on the glycosidase activities of the A/J mouse intestinal microbiome defined by pyrosequencing. Pharm Res. 2013;30(3):836–846. Ahn JY, Song JY, Yun YS, Jeong G, Choi IS. Protection of Staphylococcus aureus-infected septic mice by suppression of early acute inflammation and enhanced antimicrobial activity by ginsan. FEMS Immunol Med Microbiol. 2006;46(2):187–197. Siddiqi MZ, Siddiqi MH, Kim YJ, Jin Y, Huq MA, Yang DC. Effect of fermented red ginseng extract enriched in ginsenoside Rg3 on the differentiation and mineralization of preosteoblastic MC3T3-E1 cells. J Med Food. 2015;18(5):542–548. Chien YS, Yu ZR, Koo M, Wang BJ. Supercritical fluid extractive fractionation: study of the antioxidant activities of Panax ginseng. Sep Sci Technol. 2016;51(6):954–960. Shimada K, Fujikawa K, Yahara K, Nakamura T. Antioxidative properties of xanthan on the autoxidation of soybean oil in cyclodextrin emulsion. J Agric Food Chem. 1992;40(6):945–948. Yen GC, Hsieh CL. Reactive oxygen species scavenging activity of Du-zhong (Eucommia ulmoides oliv.) and its active compounds. J Agric Food Chem. 2000;48(8):3431–3436. Yen GC, Chung DY. Antioxidant effects of extracts from Cassia tora L. prepared under different degrees of roasting on the oxidative damage to biomolecules. J Agric Food Chem. 1999;47(4):1326–1332. Wang J, Hu S, Nie S, Yu Q, Xie M. Reviews on mechanisms of in vitro antioxidant activity of polysaccharides. Oxid Med Cell Longev. 2016;2016:5692852. Tung NH, Song GY, Nhiem NX, et al. Dammarane-type saponins from the flower buds of Panax ginseng and their intracellular radical scavenging capacity. J Agric Food Chem. 2010;58(2):868–874. Kang KS, Yokozawa T, Yamabe N, Kim HY, Park JH. ESR study on the structure and hydroxyl radical-scavenging activity relationships of ginsenosides isolated from Panax ginseng C A Meyer. Biol Pharm Bull. 2007;30(5):917–921. Sun J, Hu S, Song X. Adjuvant effects of protopanaxadiol and protopanaxatriol saponins from ginseng roots on the immune responses to ovalbumin in mice. Vaccine. 2007;25(6):1114–1120. Wang N, Wan JB, Chan SW, et al. Comparative study on saponin fractions from Panax notoginseng inhibiting inflammation-induced endothelial adhesion molecule expression and monocyte adhesion. Chin Med. 2011;6:37. Helliwell RM, ShioukHuey CO, Dhuna K, et al. Selected ginsenosides of the protopanaxdiol series are novel positive allosteric modulators of P2×7 receptors. Br J Pharmacol. 2015;172(13):3326–3340.